BP stands for the British Petroleum Company Ltd. 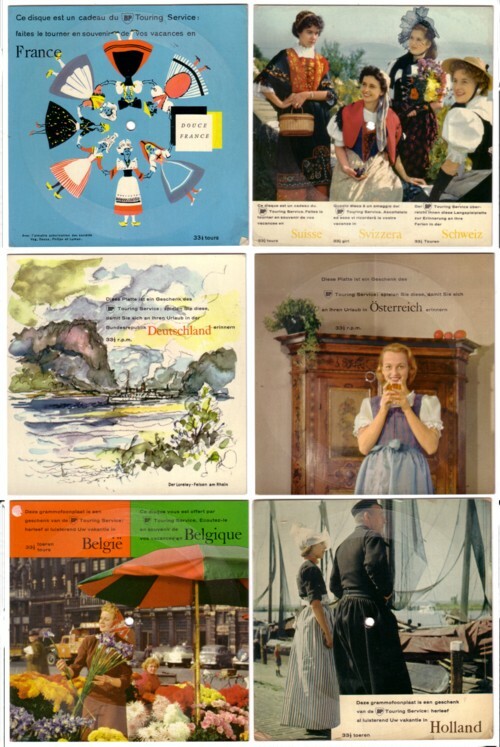 This company was responsible for at least 15 advertisement records made for the Dutch market. Among these records is a series of paper flexi souvenir records, that were giveaways for tourists who bought gasoline at a BP station in the 60’s. I have six of such records, but probably there will be more of them. That is what I like about advertisement records: you have no idea what you are collecting! On the records are songs and sounds from different European countries, that should give an impression of that country. Totally uninteresting, even for people like you and me. But as an object these records are collectors items. 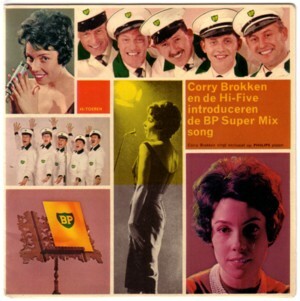 Also from the sixties is a one sided flexi record with a song to promote a new brand of gasoline from BP, BP Super Mix. The song is sung by a well known Dutch artist, Corry Brokken, who once won the European Song Contest. She is accompanied by a group called the Hi-Five, who never won the European Song Contest. I once heard that a singer in an American punk band, that visited Holland on a tour many tears ago, heard this record and was so enthusiast about it that he bought copies for all his friends. The guy who told me this story said he had read it in an article, but he could not remember where. I would like to know who this punk was, who exported all these national treasures of which we have so little. I see there are at least two paper records missing in my own collection and there’s at least one missing in yours. I will post it soon.